Myanmar has a long coastline of nearly 3 000 km. It can be divided into three coastal regions: the Rakhine Coastal Region (from the mouth of the Naaf River to Mawtin Point, about 740 km in length), the Ayeyarwaddy Delta and the Gulf of Moattama (Martaban) Coastal Region (from the Mawtin Point to the Gulf of Moattama, about 460 km in length) and the Thanintharyi Coastal Region (from the Gulf of Moattama to the mouth of the Pakchan River, about 1 200 km in length) in the Bay of Bengal and in the Andaman Sea. The Department of Fisheries (DoF) reports that fisheries are the fourth most important source of exports earnings, valued at US$ 218 in 2001. Marine capture fisheries are reported in official DoF statistics as 932 090 tonnes, freshwater fisheries as 235 530 tonnes, and aquaculture 115 870 tonnes. Of the total aquaculture production, an estimated 18 794 tonnes comes from coastal aquaculture. Shrimp farming in particular has grown significantly in the past 10 years and small amounts of marine fish (groupers) and crabs are also produced. Several thousand tonnes of crabs are "fattened" for export, but not included in the above coastal aquaculture statistics. With a coastline of nearly 3 000 km, several large estuarine, delta systems and numerous offshore islands, Myanmar possesses a considerable diversity of coastal habitats, including coral reefs, mangroves, sandy beaches and mudflats. The north-central part of the country is dominated by the vast delta of the Ayeyarwaddy River, one of the largest rivers in Southeast Asia. Several major rivers, including the Ganges in the north and Ayeyarwaddy, Sittaung and Salween in the Gulf of Martaban have created soft shores where mangroves develop extensively. Myanmar has a long coastline and adding to this the coastline of over 800 islands in Thanintharyi division alone there is an extensive coastal zone for colonization by mangroves. The key question here is the value of these mangrove systems and particularly their contribution to fisheries and the livelihoods of people living in the coastal zone. Too often, in accounting the global area of mangrove forests, Myanmar has not been included in tabulated figures. The integrative significance of Myanmar mangrove forests to regional ecosystem functions is therefore difficult to determine. Myanmar has the fourth largest expanse of mangrove areas in Southeast Asia after Malaysia, Bangladesh and Papua New Guinea (see Table 1). Myanmar mangrove forests are dominantly in the Ayeyarwaddy, Thanintharyi and Rakhine state/divisions. Shrimp aquaculture is also dominant in these areas. Mangroves in Myanmar appear to be classified as "Primary" and "Secondary" status. Primary mangrove areas are protected under jurisdiction of the Ministry of Forestry and not available for aquaculture and are essentially forest reserve. Significant jurisdiction of secondary mangroves seems to be devolved to the Department of Fisheries for availability to conversion for aquaculture. The delineation of Primary and Secondary status does not appear to be well publicized nor the criteria to define these geo-ecological zones. The function and services that these secondary mangroves provide to the Myanmar coastal zone is difficult to evaluate due to lack of available research. Some parallels can be drawn from knowledge generated on other mangrove regions of the Asia-Pacific to give some qualitative evaluation of their significance for Myanmar and highlight critical questions that may need to be answered. These issues are discussed later in this report. The chain of islands between the Ayeyarwaddy delta and the Andaman Islands contains coral reefs, but (like mangroves) they have been only minimally surveyed. Along the southern coast is a complex of forested offshore islands known as the Mergui Archipelago, where the majority of Myanmar's coral reefs are found. The Mergui reefs are thought to be similar in structure and diversity to the reefs around the offshore islands of Thailand. Currently, 65 coral species in 31 genera have been cataloged in Myanmar's reefs, but these figures are probably an underestimate. Lack of surveys and scientific information impedes a true evaluation of the wealth of Myanmar's reefs. The RRSEA project estimates that Myanmar has 1 700 km2 of coral reefs. 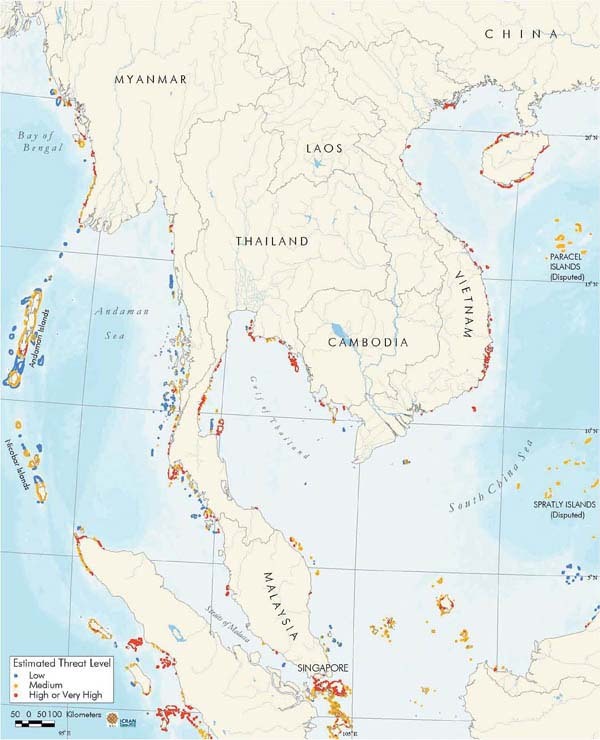 According to the Reefs at Risk analysis, 56 percent of Myanmar's reefs are threatened. The RRSEA model suggests that overfishing is the primary threat to nearly one half of Myanmar's reefs. Destructive fishing, coastal development, and sedimentation are considered each to threaten an estimated 10 percent of Myanmar's reefs. Marine-based pollution impacts only three percent of reefs (WRI, 2002). Source: UNDP/FAO (MYA/90/003): Report on Mangrove Forest Products and Utilization of the Ayeyarwaddy Delta. The long coastline contains a diversity of other marine resources systems. A detailed analysis of these resources was not possible with the information available. Up-to-date assessments of coastal resource systems are urgently needed, as the basis not only for planning of sustainable aquaculture, but for the protection and management of the countries key ecological resources. Coastal aquaculture to date is mainly focused on shrimp farming. Freshwater fish culture started in the 1950s, but shrimp farming only started in the mid-1970s. Traditional shrimp farms of about 10 000 acres (3 620 ha) have been in operation since 1978 along the banks of Naaf River in Rakhine State, bordering with Bangladesh. People in the northern Rakhine States started with "trap and hold" farming practices in areas with large inter tidal zones with abundant shrimp juveniles. Such extensive shrimp farming practices, producing 100 kg shrimp/ha/year still dominate the shrimp culture sector, due to investment constraints, although intensive practices are gradually being adopted in some coastal areas. There were some initial attempts to introduce more "scientific" shrimp culture in 1984-85 with loans from the Asian Development Bank. Technicians were trained abroad, and two shrimp hatcheries and three brackishwater shrimp farm projects established. Although shrimp hatchery production as successful to some extent, there was limited further development of shrimp farming until the mid-1990s. Only in the past 2-3 years has private and government investment being used to start operating some of these facilities again. In 1995, the Ministry of Livestock and Fisheries encouraged the development of shrimp farming and private investments in intensive and semi-intensive shrimp farming gradually emerged after the promulgation of the Aquaculture Law. FAO also provided support through a TCP project for the development of shrimp farming in the late 1990's, including assistance for small-scale shrimp hatchery development. In addition to private aquaculture farms, some small-scale farms have been initiated by UN agencies, notably in the Ayerawaddy delta. In 2000, a state level committee was established and a three-year plan initiated to encourage shrimp farming. This has led to favourable conditions for investment and significant growth in the past 3 years. According to DoF figures, cultured shrimp production in 2002 was approximately 18 800 tonnes that has increased significantly from last year production of over 6 000 MT. In 1999-2000 budget year, 12 381 tonnes of shrimp were exported that earned approximately US$ 70 million while freshwater giant prawn produced over 900 tonnes and was exported for over US$ 7 million. These values could be total export volume combined with shrimp from capture fisheries, as the cultured shrimp production for the said year was only 4 021 tonnes. Live fish export from marine cage culture was started in 1996-97 budget year with nearly 4 tonnes worth approximately US$ 8 000 from a private company in Myeik Province. The company has expanded its cage culture capacity and by 2000-01 its export volume reached over 20 tonnes. There are two other companies operating marine cage culture in Myanmar. Although mud crab culture is expanding, its production and export volume was not available. Some existing information are provided in Table 2. 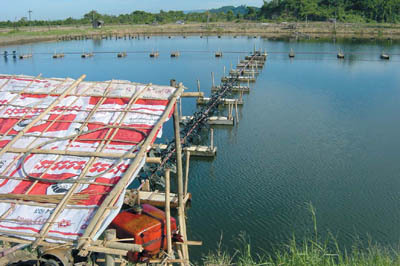 The current total shrimp farming area in 2002 is estimated as 193 265 acres (over 70,000 ha) of which over 85 percent (around 60 000 ha) is under extensive culture techniques. An estimated 5 180 acres is under more intensive culture and another 22 768 acres under improved extensive (extensive plus). Under the government's shrimp culture expansion three-year plan from 2000-2002, traditional shrimp farms were being upgraded to improved extensive culture system. 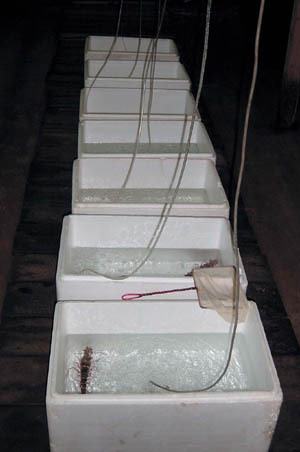 Penaeus monodon is the main species produced, but other species of wild shrimp are collected from extensive, and traditional "trap and hold" ponds. 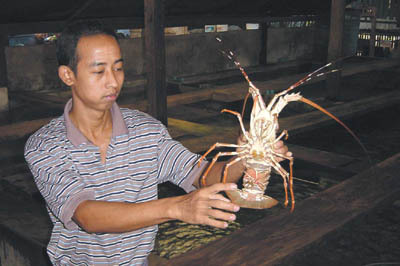 Recently, the exotic Penaeus vannamei has been introduced to at least one shrimp farm, on a trial basis. Issues and risks surrounding this exotic introduction are discussed below. The largest area of shrimp farming is found in Rakhine State (155 533 acres), followed by Ayeyarwaddy (33 373 acres), Yangon (7 394 acres), with smaller areas in Bago, Kayin, Mon and Thanintharyi. The shrimp area and production has increased substantially over the past three years under the special government programme, and particularly extensive traditional systems. In March 2000, the total shrimp farming area was 67 445 acres (24 440 ha). Although the farming area has increased drastically, Winn Latt (2003) reported that shrimp production actually declined to 6 554 tonnes in 2000-2001 budget year. Decreases in production might have been due to scarcity of wild shrimp seed and disease problems in semi-intensive and intensive farms. The shrimp production increased nearly two fold in 2001-2002 budget year, perhaps a combination of increases in area and yields. The team visited the shrimp farming zone in Yangon where intensive shrimp farming is practiced. The area is "Shrimp culture zone Number 1" at Kyauk Tan. The farms are developed on a specially designated area, on supra-tidal land (previously paddy, and coconut), covering 1 090 acres. There are 11 companies. The farms were started in 2002, without sufficient seed, and therefore were allowed to import shrimp post-larvae, leading to disease problems. All 11 farms were affected by white spot disease. The culture period is from January-May and from June-October. Water management involves a reservoir, and water treatment, according to DoF regulations. If white spot occurs, farms are not allowed to discharge, but have to treat ponds with chlorine (200 ppm) for 5-7 days before water can be released. Recent private sector investment has come from Thailand, Indonesia, and Taiwan. A large Indonesian investment is in the planning stage on an island in the southern part of the country. Some private sector investment has been used to rehabilitate shrimp hatcheries and farms developed under an ADB loan (suspended in 1988), and some new farms. Technical assistance has also been provided with such investments; however, based on the teams visits, awareness of basic pond and health management practices among the farmers is fairly limited and further education and awareness building is required. In another part of Yangon division, a project has been initiated by the DoF to support local farmers. Households have been provided with up to 50 acres of land along the seashore under another specially zoned area (Shrimp farm zone number 2). DoF support includes: shrimp culture training; soil and water quality testing; and assistance in obtaining loans from the Livestock and Fishery Development Bank (10 000-50 000 Kyats/acre). DoF reports that 4-5 households working together operate some of the farms. The project, which started in 2001, may provide an interesting case study in local peoples participation in shrimp farm development. Traditional extensive ponds tend to be very large and commonly exceeding 50 ha, although some extensive farms operated by poor farmers in Rakhine may be as small as 0.4 ha (UNHCR report). More intensive farms have smaller ponds, around 1-2 ha, similar in size to that of other countries. The very low yields, around 100 kg/ha/yr, from extensive farming systems remain a concern. Given the large area concerned, even a modest increase in pond yields could make a significant difference to total production. Although P. monodon is the main species of interest, extensive farms produce other types of shrimp, and fish for home consumption. According to a report from UNHCR in 2000, ponds in Muangdaw in Rakhine produce three types of shrimps from shrimp farms: tiger prawn (Penaeus monodon), white shrimp (most probably P. indicus) and some small shrimps. The amount and species of other shrimp varies from area to area. Apart from shrimp, brackish water fish species may be caught for home consumption, an advantage of the extensive systems. Shrimp culture viewed during the mission was confined to areas within Yangon, Rakhine and Thanintharyi State/Divisions. In Rahkine, shrimp farms have been developed on various inter-tidal lands, including what is reported as secondary mangrove. Mangroves are classified into primary and secondary mangroves, with secondary mangroves being available for aquaculture. It was unclear to the mission as to the criteria for such classification and to what extent "total ecosystem" functions have been considered. The team made a visit to a typical extensive shrimp farm in Taunggok township, Rakhine State, among secondary mangroves. The farm has been operating for 4 years. A single surrounding dyke was constructed around the whole secondary forested farm area and filled on high tide. The only digging was a subsurface canal adjacent to the dyke, due to soil removal for dyke construction. All mangroves were initially left standing and appear to have died due to bunding, with forest timber decomposing. There is an intention to later remove mangrove stumps and upright dead trees. Subsurface soils in this region are believed to be acid-sulphate with pH 3.5 to 4. Natural recruitment of larvae and natural feed are standard practices in such systems. Stocking density is estimated as approximately 1-2/m2. There is no manual input of feed or stocking. Shrimp are harvested twice monthly after first two-months of grow-out, thereafter harvested twice-monthly netting 25-30 kg per harvest. Mud crabs were also collected from the ponds. The three timber sluice gates need to be replaced annually and although concrete gates are preferred, investment costs are considered prohibitive. na: data not available; includes 74.3 ha (44 tonnes) of freshwater prawn culture under extensive improved and semi-intensive category. The secondary mangrove area visited was available for other aquaculture ventures. The land acquisition process was reported to be by formal application to local DoF authorities. The applicant needed to supply referees and the application was reported to be open to public comment. According to the farm owner there has been stable production for almost 4 years although lately there has been a noticeable decline. He attributes this decline to fall in recruitment due to increasing number of shrimp farms in the area. Sluice gates are opened at high tide but not neap tides. The pond is rarely drained totally and at most during a singular tidal cycle only. During discussion with farmers they requested information on improved farming technology. Shrimp farm management is by hired workers, often a family team. The visited farm had six adult workers. The farm owner lived in Taunggok town and employed a farm manager and workers living on-site. These farm workers were paid a net salary of 12 000-15 000 Kyats/month with food and lodging. Farm workers can harvest other aquatic products (mainly mud crabs) and retain proceeds. Workers receive a "good crop" bonus with payment coinciding with the New Year. The farmer pays 200 Kyats/acre tax to DoF annually and the lease arrangement is such that he is able to sell this farm at his own wish. There is no direct assistance from Government in the acquisition or development of his farm, however Government is providing technical assistance to upgrade the farm from extensive to extensive-plus. The extensive-plus model would involve building dykes to partition the 140-acre farm into 2-2.5 acre ponds with flow channels. The mission also visited an area in Taunggok where DoF is planning a demonstration/experiment on the upgrading or improved-extensive systems, through subdivision of the ponds, diversification of part of the farm to mud crab, and improving productivity in smaller ponds. The site represents an interesting opportunity to look at improved and mixed farming systems in mangrove areas. Shrimp seed for stocking of ponds come from the wild and from hatchery-reared post-larvae. Fry collection from the wild is particularly common in Rakhine State, where there are widespread "trap and hold" traditional farming systems relying on wild seed (stocked, or naturally entering ponds). There are probably several thousand people, including poor landless coastal people, who participate in catching of these wild shrimp fry. DoF has recently taken steps to ban collection of wild fry. The second source of fry is hatchery-reared post-larvae (PLs), and the number of hatcheries has been increasing since 1997. Currently, there are around 31 shrimp (and prawn) hatcheries that have a capacity to produce around 650 million PLs. However, DoF reports that in 2002 demand was not sufficient, and that the only around 300 million PLs were produced. The demand from grow-out shrimp farming is also seasonal. DoF estimate a total demand of 600 million PL/year. Some hatcheries produce nauplii that are then transported elsewhere for nursing to post-larvae. Some hatcheries produce both freshwater prawn and marine shrimp alternately with changing salinity. The government is keen to promote further hatchery development. However, due to reports of inconsistent spawner availability and timing of farming, seed production is either over supply or in shortage. As a result, shrimp PL were sometimes released into natural waters. There are government owned hatcheries, but some have been sold or leased out to the private sector, or are carried out as joint venture operation with private companies (DoF, 1999). Costs of hatchery operation are reported by DoF to be quite high, due to high cost of inputs (e.g. Artemia). Problems have emerged in the balance between supply and demand. For example, shrimp farm grow out ponds were developed quite fast at Kyauk Tan, without sufficient seeds. Therefore, farmers were given permission to import post-larvae. The inevitable result was that Myanmar introduced the white spot syndrome virus (WSSV), and serious outbreaks of shrimp disease were encountered. All 11 farms in the Kyauk Tan area were reported to the team as being affected by white spot, and the disease now seems to be spreading around the country. Introducing effective import procedures and hatchery and farm health management practices are essential to support the sustainable development of the shrimp industry. Recommendations on this issue are provided later in this report. The mission visited hatcheries near Yangon, and in Rakhine state. 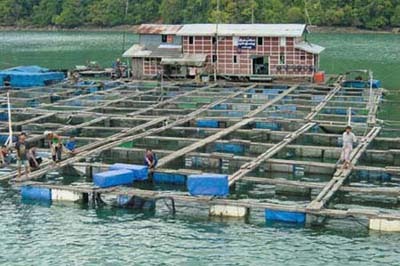 In one hatchery near Thandwe, problems of bacterial disease had affected the production in 2002 (necrosis and Vibrio problems reported). This farm was also using crab to feed mature animals, a practice that may lead to WSSV infection of brood stock. Spawner mortality was also reported as a problem. The visits clearly indicate a number of areas for improvement of hatchery management practices and disease control measures. 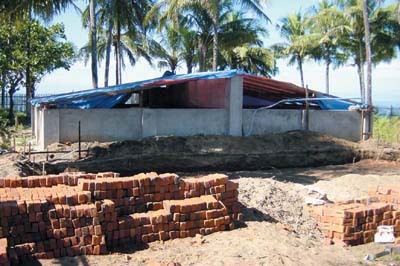 Shrimp hatchery under construction in Rakhine State. Penaeus monodon brood stock collected in Rakhine State. Shrimp brood stock appear relatively abundant in Myanmar, and indeed the Andaman Sea as a whole is an important source of brood stock for neighbouring countries. Shrimp brood stock can be exported under licence from the Department of Fisheries. Gravid females are sold at about 4 000 Kyats, a price that is relatively cheap compared to other countries in the region (commonly US$ 100 or more). From Thandwe, hatchery operators reported a six hour boat journey to collect brood stock. There is a close season during August-September when marine fishing, including shrimp brood stock collection, is not allowed. One hatchery in Thandwe reported that 40 percent of brood stock collected were WSSV positive, an alarming figure, if correct. Further investigations should be carried out. A major issue in the shrimp farming sector is feed supply. Local made commercial feeds are becoming available, but some intensive farms still import feed from abroad. Fish meal plants have been established in the past 3-4 years to take advantage of the good local supply of fish meal. There are now five local feed mills for fish and shrimp/prawn, with one factory producing 15 tonnes/day of pelleted feed. Win Lat (2003) reports the need to improve quality and quantity of shrimp feed. Imported feeds also have various disadvantages, such as difficulties in importing via border trade and quality problems due to long transport and import procedures. There is no import of fish meal, as Myanmar has good fish meal resources. The technology for fish and shrimp feed production comes from China and Taiwan. 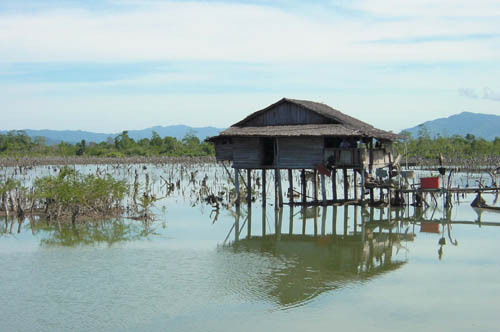 The traditional shrimp farms that still dominate Myanmar are developed on inter-tidal land, including mangrove areas. In the Yangon division, some intensive farms have been developed on supra-tidal, low yielding, agricultural land. The team visited Yunadi shrimp farm (Kyauk Tan) where there are 11 companies involved with shrimp farming. The land in this area, previously agricultural land, has been designated as a shrimp culture zone. However, reports suggest difficulties in obtaining permission from the Department of Agriculture for establishing further zones on agriculture land. A different type of project had been started in another part of Kyauk Tan, outside Yangon. Coastal areas are allocated to individual families, with 50 acres per family. Services are being provided by the DoF, including shrimp culture training, soil and water tests, and availability of loans from the Livestock and Fishery Development Bank (Kyats 10 000-50 000/acre). DoF officials say that there may be 4-5 households per farming area and report to the team that 50 families were involved. The project had started in 2001 as an experiment to involve local people in shrimp farming. Unfortunately, some farms had experienced white spot disease problems. It would be interesting to undertake a more detailed analysis of the project, and its potential for replication elsewhere in coastal areas of Myanmar. Shrimp disease problems have recently emerged, already causing serious economic impacts to shrimp farms in Myanmar, including semi-intensive and extensive farms, and it appears that shrimp brood stock may be infected to varying degrees. The effects on wild populations are unknown. White spot disease (WSD) was first reported in 1999 or 2000, and apparently related to the introduction of post-larvae from abroad (reports suggested PLs were imported due to local shortages, without any risk reduction measures). The disease has spread throughout the country, affecting both intensive and extensive farms. Semi-intensive shrimp ponds in Rakhine State. DoF is taking actions to address the problem. These include some disease monitoring, development of PCR testing facilities, and looking at other possible causes of shrimp disease problems, such as environmental change. The current situation though, if not brought under control through urgent action, represents a serious threat to the sustainability of shrimp farm investments, Myanmar's ability to attract foreign investment, and future trade status. Shrimp health management strategies are required urgently at national and farm levels, involving government and private sector. The policy towards import and movement of live aquatic animals deserves special attention. Already Myanmar has lost a major comparative advantage (white spot disease status) due to ill-advised imports, and one report suggests Myanmar has faced trade problems of white spot in consignment of prawn/ shrimp exported to one market. Future controls are essential, and should be agreed to and monitored by both government and private sector. Regarding other species, Myanmar's groupers and native seabass may be relatively unaffected (e.g. from VNN, iridovirus), and again introductions should be avoided (e.g. if grouper fry catches should decline), or if necessary only under strict quarantine conditions following regional protocols (FAO/NACA, 2000). Myanmar was a participant in the development of the Asian Regional Technical Guidelines on Health Management and Responsible Movement of Live Aquatic Animals (FAO/NACA, 2000). The development of a national strategy for implementation of the guidelines in Myanmar is essential to protect the aquaculture industry and future trade status. The current ban on imports of shrimp PLs is a good decision by the government, since there are no risk assessment measures in place for imports, and no facility for testing the quality of the import PL. This capacity should be developed as part of the national strategy implementation. PCR and diagnostic capacity. One PCR testing centre is under construction in Thaketa Government Hatchery in Yangon. This testing centre will provide a PL testing service for WSSV to support farmers in the Yangon area. Ideally, testing facilities should be established in major brood stock sourcing areas, with priority to Thandwe. A shrimp brood stock screening scheme will substantially reduce the chance of PL contamination. One more PCR testing centre is required in the southern area (for example in Myeik). Laboratories should be supported by development of standard protocols, training, and laboratory procedures. Brood stock testing centre. Since there are only around 20 hatcheries producing PL at the moment, it should be relatively simple to introduce effective health management measures to significantly reduce risk of WSSV virus spreading with infected post-larvae. It was estimated that, based on the PL requirement (600 million/year), a maximum of 4 000 brood stock are required over one year. If all the brood stock are tested as WSSV free before release to the hatcheries, the chance of contamination will be greatly reduced. A government-private brood stock testing centre should be established with the support from private hatcheries since in practice, private hatcheries will have to test the brood stock before using by themselves. There are two main landing ports for the brooder, in Thandwe and one on the southern coast, therefore two testing centres are probably required. Strengthen government and private extension programme. Similar to the other Asian countries, the government lacks experienced extension staff to provide basic training in shrimp health management to support local farmers. The information received by the farmer is mainly from neighbours, private sale persons or technicians. The government should try to engage the private sector since they normally have better access to farmers than the government staff. At the same time, the government can arrange training/workshops for farmers with some financial support from private sector. A concerted effort and collaboration between the government and private sector should be initiated as a matter of urgency to ensure that farm staff are properly trained, and equipped with the know-how to identify/manage disease problems. Prepare a Code of Practice. The government is encouraged to develop a health management "Code of Practice" to be agreed between government and private sector. This should include an agreed programme of brood stock testing, chemical and drug use testing and registration, imports of aquatic animals. Adherence to this Code of Practice that will protect aquaculture investments in the country, could be a condition of investment in the shrimp farming business in Myanmar. Classic clinical signs of white spot disease in Penaeus monodon. The mission considers that existing experiences from NACA, FAO and ACIAR support for shrimp health management in the Asian region should be engaged to support development of a shrimp health management strategy. An outline of recommended white spot "risk management" measures are given in the adjacent box. Although the management measures are relatively straight forward, implementation will require a substantial extension effort, backed up by suitable trained staff and laboratory facilities. The establishment of zones for shrimp culture as the team saw in Yangon division is a positive step that allows coordinated actions to be taken to disease control and environmental management. Ideally, such schemes should follow regulations developed by the government in order to reduce the risks of disease spreading from the different farming areas. Zoning principles should also be applied to separate major hatchery zones away from major intensive farming zones, further helping to reduce risks. Regarding the current ban on import of Penaeus vannamei, most of the farmers interviewed during the mission misunderstand this white shrimp. They believe that the shrimp are stronger and more tolerant to extreme conditions than black tiger. P. vannamei is thought to be free from any disease. Therefore, it should be easier to culture. But the reality is that many white shrimp available in Asia are not really pathogen free (SPF) stock and some may be contaminated with exotic viruses (e.g. Taura syndrome virus). If farmers import contaminated PL and stock in different places, this will be a major route to contaminate the wild population and finally leading to a serious outbreak. The government should not allow importing any white shrimp into the country at this stage. As Myanmar will likely continue to receive requests from the private sector for imports, further advice should become available from an assessment of Penaeus vannamei imports to Asia, being planned by FAO/NACA in 2003. As most shrimp farming is traditional or extensive, shrimp farmers use few chemicals or drugs. Indeed, the shrimp produced from such systems should be very good quality, "organic" type. The team noted however, that some hatcheries and more intensive farms were using a range of chemicals to control shrimp disease. These chemicals were not always in clearly labelled containers (none in Myanmar language), and in one case a banned compound was noted in a hatchery, a chemical that may lead to residue problems for shrimp imported to EU and other countries. The team considers that further attention is needed to restrict use of chemicals, perhaps by developing regulations that control the import and use of chemicals in shrimp aquaculture in Myanmar. Further awareness should be created among private sector investors of the need to avoid use of banned chemicals. Labels for use should also be prepared in Myanmar language. This could be done in cooperation with some of the major importing companies that are increasingly active in the coastal areas of Myanmar. Regular monitoring of crop health and environmental conditions. Intervene to control adverse conditions or emergency harvests. Further information on banned drugs can be obtained from FAO and NACA. Shrimp and prawns are making an increasingly significant contribution to the export earnings of Myanmar. Major markets for "prawns" (DoF statistics do not differentiate between freshwater prawns and brackishwater shrimp) are China (4 073 tonnes, but lower value), Singapore (2 604 tonnes), Japan (2 992 tonnes), and United States (1 775 tonnes). EU also imports prawns from Myanmar, with UK as the leading importer at 921 tonnes. The total value of "prawn" exports is US$ 104 million for 2000-2001 as reported in the Fisheries Statistics of Myanmar, out of a total of US$ 218 million. The high demand and price of shrimp and prawn abroad have attracted local and foreign investors in fishery product trading. Meanwhile, shrimp and prawn production from capture fisheries has declined, and aquaculture is becoming a more important source of supply. Market channels exist for high value shrimp, involving middlemen, brokering and raw material collecting systems. The export market for high value aquatic products remains high and consequently shrimp receives a high policy priority. Myanmar has faced some marketing problems, including when the EU imposed trade restriction over products from Myanmar in 1998. This caused seafood trading companies to suffer losses and shrimp and prawn exports to the EU were restricted. The team did not look in detail at quality control systems, but noted that the Department of Fisheries has made investments in a good laboratory at Thaketa, with facilities for residues and quality analysis. The private sector has also invested in laboratories for quality control, as seen by the team in Myeik. Such quality control mechanisms are essential to maintain access to markets. Increasingly, importing/consuming countries are paying attention to the production system, particularly food safety concerns associated with use of chemicals and microbial contamination at pond level. Such issues will need more attention in future. Mud crab farming is also important in Myanmar. Mud crab (Scylla serrata, and related species) culture in mangroves or tidal flats is practiced mainly in the Ayeyarwaddy delta area, in Rakhine and southern parts of Myanmar. The farming practice can be ecologically friendly because it does not replace mangrove and uses locally available low cost materials. Most farming is practiced in ponds (fattening crab), bamboo enclosures or cages located in river and canal systems. Culture densities for ponds and cages in Rakhine are reported as two to four juveniles/m2 (weighting 25 to 40 g/piece) and 10 to 25 kg/m2 respectively. Chopped trash fish, Acetes and agricultural by-products are used for feeding crab. After six to seven months, marketable crabs (200-250 g/piece) are harvested by handpicking during low tide. Win Lat (2003) reported a survival rate of 40 to 60 percent, and yields may be 275 to 600 kg/ha/crop. Mud crab may also be harvested along with shrimp in traditional or extensive shrimp ponds. One farmer interviewed by the Mission in Tangatt Township was fattening mud crabs successfully in a 1.5 acre pen. Trade in mud crab (Scylla spp.) appears to be thriving in the Ayeyarwaddy delta region. A large part of the production is for export to Singapore and China, including significant quantities transported to China by road. Since crabs must arrive live at their final destination, the trading network is well organized. The coastal team visited the Doung Koo Maw crab culture farm in Myeik. This is the only farm in Myanmar, producing soft-shelled crab. The farm collects mangrove crabs from local areas; the owner when interviewed suggested that crabs come from within a five kilometer radius. The farm started in 2000 with 209 acres of ponds, although only 8.25 acres are used for crab culture. Local fishermen harvest the mud crabs from the wild over 4-5 days during the full moon period. A small trap is used for catching crabs, in mangrove areas, and other local waterways. The prices reportedly vary with size; smaller sizes are 15 pieces/kg (1 200 Kyats/kg), or 10 pieces/kg (slightly larger size). There are reported to be 500 collectors involved. Each fisherman can catch up to 40 kg (maximum) in the full moon period. The farm prefers to obtain small size also. The technology is based on crab farming in Ranong (Thailand), and the owner of the Ranong farm is a shareholder in the Myeik farm. After capture, the mud crabs are put in individual containers then after 4-5 days they will moult (some may take longer up to 60 days). 100-150 g size crabs are sold with a market price of 4.4 US$/kg. The owner says that the crabs lose 30 percent weight (however, looking at the crabs this seems unlikely) with a 90 percent survival of crabs. The farm is trying some experiments to look at whether cutting swimmetes will accelerate moulting. However, this technique increases mortality to 30 percent. So far, the farm has produced 40 tonnes of soft shelled crab. Feed is small fish and 60 tonnes have been used so far. The price of trash fish is 40-60 Kyats/kg (80 Kyats/kg maximum, and 30 Kyats/kg minimum). Fish is cut into small pieces by women (see image below) (fish heads and guts are removed and sent to a fish meal plant) and the fish body is fed to crabs. Crabs are kept individually in containers held on rafts. The containers are checked every three hours, and molted crabs removed. Molted crabs are put in freshwater as they will harden if kept in brackishwater (after 3 hours). They may spend 1-2 days in freshwater before being sent to factory for freezing. Scenes from a mud crab fattening farm near Myeik. Crabs are frozen and then marketed through Penang. The final destination is Japan as well as Malaysia. The owner/ manager said there were market limitations, and was seeking to diversify markets (there is an interesting research question here of whether market is a constraint). Supply of wild crabs was not seen as a constraint. The farm employs 150 workers, of which 90 percent are women. Women are involved in cutting fish, cleaning baskets, feeding and checking crabs. Groupers, Epinephelus sp., popularly known as "Kyauk Nga" or "Nga Tauk Tu" in Myanmar language, are important marine fishes belonging to the Family Serranidae. Groupers are exported live, and in chilled/frozen forms, from Myanmar. The export of live groupers is intended primarily for the live reef fish trade, to Hong Kong. Marine and brackishwater fish farming is found in Ayeyarwaddy delta area, Rakhine and southern parts of Myanmar. There is some extensive pond culture of seabass (Lates calcarifer) in these areas, and seabass are also collected from extensive shrimp ponds. DoF reports some import of seabass fry from Thailand, and export of seabass to Australia. Again, as stressed above, care is essential when importing fish to ensure no health problems. Groupers are cultured in Myanmar using fry and juveniles caught from the wild. There is no marine fish hatchery. Fish farmers grow them in net cages and ponds. 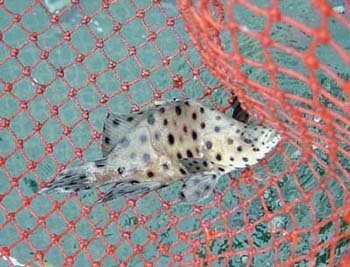 Presently, floating net cage culture of groupers is conducted in the coastal areas at the southern and western part of Myanmar (Myeik Archipelago and Gwa township). Grouper seeds for culturing are obtained from the wild. There are around twenty species of groupers in Myanmar waters, but so far only four species have been cultured commercially. The main species are orange spotted grouper (E. coioides), greasy grouper (E. tauvina), black spotted grouper (E. malabaricus) (Myanmar name Goung Lone Anet Pyauk) and E. bleekeri duskytail grouper (Myanmar name Bather Pyauk). The team visited a cage farm in Myeik where small numbers of giant grouper (E. lanceolatus) and E. fuscoguttatus, mouse grouper (Cromileptis altivelis) and some ornamental fish were also present. The mangrove red snapper (Lutjanus argentimaculatus) was also being cultured. Small numbers of Emperor red snapper (Lutjanus sebae) and Cephalopholis species (probably C. argus) were also noted on the cages. The list of grouper as reported from Myanmar waters from a recent APEC paper is given in the adjacent box above (Tin Win, 2002). Grouper fry are collected using various devices including rock mounds, brush piles, brush lures, and fish traps. The grouper farm visited was operated by the Pyi Phyo Tun international company. The project was approved in 1995 and implementation started in 1996. Technical assistance was provided by technicians from Hong Kong. Total investment was reported as 65 million Kyats. The farm is at Mawtonegyi in Kyunsu Township. The project started at 150 cages, now there are 270 cages, with size of 3 m x 3 m, and depth 1.5 m. The site is close to an island, that provides shelter and freshwater. The water depth is 6.5 m at lowest tide. The farm does not move cages around, although some fish cages were moved following a mortality/disease problem that was experienced. The bottom in the area is sandy, suggesting reasonable water movement to disperse cage wastes. The farm stocks both fingerlings and larger fish. The farm reports catching around 3 000 fish every 15 days, peaking around the full moon day. Fish are caught by hook and lines (feathered hooks) and to a lesser extent traps. The fish are purchased directly from fishers, or from middle men/agents. Prices are set on size (not species), at 100 Kyats/piece (6-10 inches), and 700 Kyats (above 11 inches, weighing more than 300 g). The farm reports that local catches are declining, and fish are now collected from further away. Fish come from 30-50 km away, and some as much as 70 km away. The most recent area is Yeantoung town, about 70 km away from the farm. Six agents/middlemen are reported to be involved, with a total of 700-800 fishermen selling wild caught fish. The farm reported no regulations on the size of fish that can be caught for stocking in cages; however, DoF regulations stipulate that only fish over 300 g size may be harvested. The mission received no reports of cyanide fishing in Myeik, but received a report from Rakhine. The close season for catching fingerlings is from July-September. The fish are fed daily in the morning, with an estimated 3 tonnes of trash fish needed for around 400 000 grouper. The trash fish come from the company trawlers. There has been at least one fish mortality (cages were moved, and this was reported to have solved the problem). Fish are treated using formalin, and freshwater to treat parasites. There is a piped supply for freshwater from the nearby island to use for treatments. Grouper cage culture near Myeik. The fish sale price is reported to be set on size (not species): 5 US$/kg for fish above 1 kg; 3 US$/kg for fish less than 1 kg. Fish are exported in a live fish transport boat to Hong Kong. Export is carried out 4/5 times/year, with 5-6 metric tonnes/time. The price is around 6 500 US$/tonne, depending on size. The transport boat is reported to be less concerned about species. The boat was reported to visit at least one other site (a nearby coral island - where there are 100 cages) to collect fish. The farm employs 32 workers. The salary is around 10 000 Kyats/month, to 50 000 Kyats/month. There are reported to be two other grouper farms in the division - one of 100 cages, plus one other (no information). The major issues arising from the mission include the need for assessment of state of wild caught resource and development of techniques for sustainable harvest. Such information to support sustainable management of the wild grouper resource is urgently needed. In the future, sustaining a grouper industry will need hatchery development, and attention to development of feeds. Myanmar, because of the ready availability of "trash" fish and fish meal, would be in a good position for development of a marine fish industry based on locally made feeds. The DoF has a further marine fish hatchery in Thandwe, where work is being started on seabass (Lates calcarifer) breeding, and the plan is then to graduate to grouper after experience in gained. One of the keys to successful breeding is a healthy brood stock, that can take many years to collect and mature. The importance of early collecting of grouper brood stock for such hatchery projects is emphasized. The DoF recognizes the potential for future development of mariculture in the southern part of Myanmar. The main initiative for mariculture development in this area within DoF is the plan to establish a marine aquaculture station at Kyun Su Township in Thanintharyi division, starting in 2003 (a budget of 30 million Kyats has been allocated). The DoF plan to start work with seabass culture, but eventually will extend the work to include groupers. One aquaculturist has been assigned to the project. There are opportunities for external assistance in training of staff, and design of the facility. The mission was informed of several other coastal aquaculture activities. Oyster aquaculture was tried in Rakhine during the 1990's, but not successful. Cockles have been harvested from natural beds, but no management applied (apart from licensing). A cockle farm/bed in southern Myanmar had imported seed from Thailand, but was now using local seed from Myanmar. Gracilaria culture (seaweed, involving two species) was attempted in 1980's in Rakhine state, but apparently not successful. The mission visited a lobster holding facility in Myeik (The Golden Star Ice Factory, Pyi Phyo Tun International Company) where lobsters are held prior to export. The lobsters are purchased from fishermen and then exported to Hong Kong. They are reported to be exported live via Yangon. Three species are involved - Panulirus versicolor (buy at 12 US$/kg, sell at 30 US$ 30/kg), P. Longipes (2 species, no prices provided), and P. ornatus (buy at 40 US$/kg, sell at 80 US$ 80/kg). Lobsters are reported to be captured by hand and trap. There are three other similar operations in Myeik. Squilla, some groupers, and a moray eel were also noted in the tanks. Two separate water management/tank systems were used to separate systems. The holding facility exported US$ 1.305 million of exports in 1999. The DoF regulations provide a 100 g limit on size of lobster captured. There is no farming of lobster in Myanmar, but this could be a potentially important opportunity for further investigation (provided sustainable management measures for collection of juveniles could be ensured). There are also pearl farms in Myanmar. In Bokepyin, there are four pearl farms (a Japanese and Malaysian investment). The species are Pinctada maxima (gold lip pearl) and P. margaritifera (black lip pearl). The administration of pearl farming is with the Ministry of Mining, not the Department of Fisheries. The general picture that emerges from the mission and review of secondary information is of a coastal population that includes significant numbers of poor and vulnerable people and a high proportion of people dependant on fisheries activities and aquatic products for income and nutritional security. The current status of coastal aquaculture is quite limited, but already the livelihoods of perhaps several thousand people are directly and indirectly involved in the sector. More people are involved indirectly (e.g. collection of shrimp post-larvae, and collection of crabs and grouper fry, women involved in preparation of feed for mud crab fattening) that directly in production. Even so, numbers are probably quite small compared to the inland sector. Wild-caught lobster at holding facility in Myeik, ready for export. The mission's visits to Rakhine and Thanintharyi provide an initial overview of the situation, but further assessments would provide better understanding of the livelihoods of people in coastal communities and a better basis for interventions to support responsible development of coastal aquaculture. Rakhine State has the lowest average household expenditure (<0.5 US$/day/household) in Myanmar, way below international poverty line and one of the poorest in Myanmar, with some extremely poor people subject to special assistance programmes (e.g. UNHCR). The coastal population relies heavily on fishing and aquatic products for income and food. In northern Rakhine, coastal households are involved in shrimp fry collection and are directly involved in shrimp aquaculture, and to a limited extent mud crabs and grouper cage farming. Thanintharyi Division in southern Myanmar includes the Myeik archipelago with over 800 islands. The division has a higher average household expenditure (0.6 US$/day/ household), but still considerably below the international poverty line. The population in the Division relies heavily on fishing (80 percent reported to be involved in some way). Aquaculture has potential to be a significant source of income and employment for people living in this division. The mission was unable to evaluate to what extent poorer members of the coastal community have benefited from coastal aquaculture, although opportunities may be substantial to support local development through sustainable aquaculture. Information is required (e.g. through livelihood analysis) in Rakhine and Thanintharyi regions to understand livelihoods to gauge opportunities for support for aquaculture. Such information is not available from existing sources, but may perhaps be obtained by the upcoming census, or through special assessment. Some limited experience in small-scale coastal aquaculture exists within the UN-HDI supported project in the Ayeyarwaddy Division (Bogalay, Laputta and Mawlamyine Gyun). Small-scale aquaculture trials were started with fish cage culture, shrimp culture, mud-crab pen culture and oyster culture. According to the project reports, fish cage culture faced problem with debris carried down by the tidal waves clogging the cages. Moreover the cost of materials used in the construction of cages were expensive for small holders. Prawn culture with cages constructed using bamboo has been successful with potential for expansion, and a few landless people have adopted it. Mud crab pen culture was considered to have potential for expansion on a commercial scale in the near future. Oyster culture trials did not produce any conclusive results. The UNDP project considered that crab fattening in particular was a suitable poverty alleviation activity, as it requires only a small plot of land, yielding favourable income in just two-weeks. A number of aquaculture activities initiated by the project in the villages were replicated in the adjoining villages, as well as in the adjoining non-project townships, due to their lucrative nature. The UNDP project also provides an indication of the important role that small-scale fishery activities play for poor, landless, people in the Ayeyarwaddy delta, suggesting that an integrated approach to development, considering aquaculture and fishery activities, within the context of a rural development approach may be successful for poverty reduction, rather than purely sectoral or sub-sectoral driven initiatives. A further project involving aquaculture was implemented in Rakhine, under an UNHCR programme, although outcomes were not available to the mission. Women are involved in coastal aquaculture and participate in production and providing inputs. Win Lat (2003) reports women's involvement in pond construction or embankment repairs. Women and children gather wild shrimp seeds from tidal creeks for rearing in traditional ponds in Rakhine State, and are involved in post-harvest activities on other coastal aquaculture farms. The most impressive involvement of women in aquaculture seen by the mission was in the mud crab fattening farm in Myeik. Here, women were involved in various ways in tending crabs and preparing crab feed. Investment in coastal aquaculture is presently focused on export commodities. From the mission's brief overview, it appears to be mainly richer individuals/companies who are directly involved, with shrimp as the main item, and smaller amounts of crab and grouper. 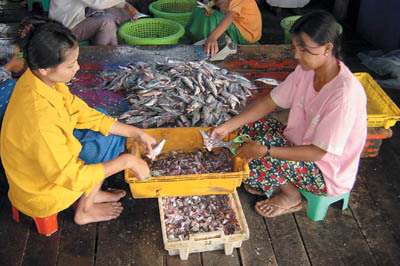 Investment by larger companies/individuals has proved important in developing infrastructure for aquaculture, for example, private sector investment support to shrimp hatcheries, and employment, such as several hundred people involved in Myeik (women in soft-shell crab farm) and input supplies (mud crab, trash fish, and grouper fry supply to cage farms in Thanintharyi Division). The mission considers the opportunities for participation of local small-holders in coastal aquaculture should be further explored and supported, where appropriate. Regarding the potential for small-scale poverty-focused mariculture, there are major questions of technology, extension support, capital access and security that remain unanswered. If non-technical constraints can be addressed, technology for several species might offer opportunities to support small-scale aquaculture in coastal areas, which if conducted correctly will contribute to foreign exchange earnings as well as coastal development. The mission recommends an assessment be undertaken to evaluate opportunities, including gathering of experience from recent UN-sponsored aquaculture projects initiated as part of poverty reduction projects. The grass roots participation in shrimp farming is reported by Winn Latt (2003) to be mainly limited to hired labour. The large farms that are common are a significant barrier to entry and should be reduced by farm size and ensuring security of land tenure. The DoF should consider further industry development programme of small farms available to local grass-roots community, perhaps based on experiences in "Shrimp farming zone number 2", where special attention is reported to have been given to the local community. Aquaculture development could consider the agriculture demography model (see Table 4). While absolute agriculture farm size may not be feasible for aquaculture it nevertheless displays a relative demography, which may facilitate some entry into the industry by the poor. It is essential that there is security of land tenure and skill transfer so that micro-credit schemes will feel secure in their investment. Currently, established traditional/extensive shrimp farms seem to focus mostly on mono-culture of shrimp. Diversifying the income base will help reduce risk. In mangrove forests, diversifying into mangrove forest related income opportunities such as low cost/low technology crab culture could be explored. It is unlikely at this stage that silviculture will be attractive to farmers, given the vast timber reserves of Myanmar and the prohibition of charcoal production since 1993. To suggest silviculture mangrove forestry for charcoal production may be risky in that it could require significant resources to regulate due to potential encroachment on natural forests. Extensive, traditional, shrimp pond in Rakhine State. The Department of Fisheries (1999) emphasises resource sustainability and environmental issues in the strategy for national agriculture development within the Livestock and Fisheries Sector. Environmental issues need to be carefully considered in the development of coastal aquaculture in Myanmar; paying close attention to environmental management of the sector will not only provide a sound basis for sustainable development, but will also ensure continued market access into importing markets that are becoming increasingly sensitive to environmental concerns. As coastal aquaculture is still relatively undeveloped, compared to other countries in the region, there are good opportunities to learn from others, and adopt more effective environmental management practices. The following discusses some of the resource management and environmental issues arising during the mission. There is some development of shrimp farming in mangrove areas. This, in part, appears to be driven by the government policy not convert agriculture land to aquaculture. In coastal areas, this leaves so-called "unused" land for aquaculture, in Rakhine state at least secondary mangroves are classified in this category, meaning shrimp farms can be developed in secondary mangroves. Biota in mangrove habitats has been harvested for many centuries - fish and shrimp being common products. The preservation of mangroves has for many years been argued on the basis of their function as nektonic habitats among their many other valuable roles. Mangroves harbour higher densities of juvenile fishes than other adjacent habitats evident from studies in the Indo-west Pacific and elsewhere. This suggests that mangroves are a source of food shelter and protection. Studies of prawns and fish indicate an important role as nursery grounds and refuge from predators. Many of these coastal species spend critical early stages of their lives in mangrove waters. There are several patterns of diversity in mangrove species and habituating organisms in communities. More species are found in large rather than small mangrove estuaries. Mangrove fish communities in the Indo-west Pacific are species rich compared to Atlantic regions. Sub-tropical estuaries house fewer species than tropical estuaries. Connectivity between mangroves and adjacent ecosystems influence diversity. 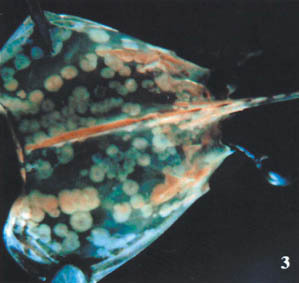 Nature of offshore environment is critical in determining movements of larvae and juveniles. According to a recent JICA report (2000) there are 29 species of mangroves in Myanmar hosting 69 species of fish, 13 species of shrimp, 4 species of crab and 9 species of other shellfish. However, information on mangroves in Myanmar is sparse. Disturbance and alteration of mangrove habitats tend to lead to departure of fish populations and other nekton and they do not readily return to the impacted zone. Recovery depends on duration, geographical extent and nature of impact. Habitat loss therefore results in low population densities and loss of diversity of mangrove habituating organisms. In a planned geographic disturbance by human intervention such as aquaculture and urban development it raises the question of interference into population connectivity among (micro) habitats. In a larger mangrove ecosystem framework some areas of mangroves and waterways may be critical in facilitating migration patterns between microhabitats to the upper/lower estuary and offshore. The selectivity of which secondary mangrove areas to convert for aquaculture must consider these factors, to ensure regional sustainability of fisheries production and ecosystem services. The risk here is that the opportunity cost of conversion could be greater than the returns from aquaculture. At minimum, selectivity of which tracts of secondary mangrove forests should be removed must be based on ecological research to ensure that returns from aquaculture are far greater than the opportunity cost of services that targeted mangroves provide. Mangroves occur in a variety of climates from arid to cool temperate and equatorial regions. They also occur in a variety of soil types from clays, silts, sands, coral line rubble and peat. Salinity can range from close to 0 to 90. It would be illogical to presume that there would be a uniform productivity at regional or subregional level. The current contribution of mangroves to fisheries is not adequately quantifiable for Myanmar due to lack of research. Foundational data needs to be researched to sample habitats for their relationships to fisheries production. While some generic models have been suggested none appear to have sufficient robustness to quantifiably value mangrove systems generically for fisheries production. The drawbacks of these models are evident by the need to support them by hypothesis rather than empirical data. Mangrove plant biomass in a fisheries context can be viewed as that which is accumulated and that which is released from forest structure. Accumulated biomass (above and below ground) establishes the physical forest structure. The non-accumulated portion is shed by trees and can include litterfall, algae, root loss, root leachates and herbivore grazing. These losses and their movement via tidal outwellings and/ or incorporation into other biogeochemical processes can form an essential dimension of inshore or offshore habitat sustainment. If forest detrital supply is reduced then there could be interference to coastal food chains (habitats) reliant on that supply. Nutrient uptake from land runoff by mangroves suggests that they can be effective pollutant sinks as they are efficient nitrogen and phosphorus accumulators. These nutrients can be incorporated for biomass production or stored within the plant for later use. Mangroves have significant capacity to absorb dissolved nutrients and other elemental species. If the plant has no immediate physiological use for these nutrients they can be stored in the root systems. Furthermore the complex root systems of mangroves can be very effective at trapping sediments from land runoff sources. If conditions are appropriate, mangroves can colonize sediments and stabilize them to modify the foreshore and reduce re-suspension thus ensuring some protection for near shore habitats. Mangroves can provide very effective protection against potentially erosive wave-action, which is a substantial consideration in areas such as Rakhine State, which is prone to cyclonic events. Rakhine State also has a near coastal range (Rakhaing Yoma). Episodic heavy rainfall events can result in rapid land runoff where mangroves can play an important role in trapping sediments before this runoff water body reaches the open sea. There are a number of issues for consideration with the traditional or improved extensive shrimp farm models in mangrove areas. These include displacement of secondary mangroves; in-pond mangrove forest decomposition; farm size, tenure and equitable entry to the industry; and lack of farm income diversification/security. The choice of which secondary mangroves are selected for conversion to aquaculture does not appear to be based on any valuation of ecosystem services provided by these forests. It is not known what type of (micro) habitat is being removed by bunding forests or which ecosystem processes are being interfered. While it may be difficult to quantitatively value secondary mangroves, some attempts should be made to qualitatively value based on fundamental research into their role and function. The decision as to which tracts of secondary mangroves are made available for aquaculture development can then be based on minimum opportunity cost for longer-term sustainability. In the extensive model, mangroves are not clear felled prior to filling ponds with water after dyke construction. Once bunded, tree respiration is interfered resulting in tree death. The gradual in-pond forest decomposition can adversely affect water chemistry and pond quality. Initially litter leaching of organic matter occurs (particularly tannins) followed by bacterial and fungal community assisted decomposition. Wood components also decay through chemical and biologically assisted processes. Teredind molluscs have been found to be an important agent in mangrove wood decomposition. Root systems also begin to decompose with decomposition rates being dependent on species and root diameter. These induced forest decomposition processes can impact on pond quality and affect sediment-water interface processes. The breakdown of this introduced organic matter could elevate oxygen demand. Enhanced bacterial populations can amplify amplitudes of dissolved oxygen content due to increased respiration rates imbalanced to photosynthetic production. This can render low net primary production leading to critical oxygen levels inducing stress to shrimp. The impact of decaying mangrove matter specifically in-pond has not been studied. It may be beneficial to clear fell forest before pond construction to alleviate organic matter loading and its potential adverse affects. Farm size in regions visited was generally large-scale farms owned by more wealthy individuals/companies or foreign investors. It was notable that there appears to be a stark absence of community level aquaculture. Farms of 20-30 acres are common in other developing countries (e.g. Mekong delta of Viet Nam) owned by local people as the basis of their livelihood. The grass roots participation in Myanmar appears to be more limited, although some models are being tried. These large farms are a significant barrier to entry and should be reduced by farm size and ensuring security of land tenure. Government should consider an industry development programme of small farms available to local grassroots community. Some prerequisites are essential such as training in farm operations/management, disease management, market analysts, transport systems and optimal mangrove buffering capacity to ensure basal natural recruitment to be sustainable. The demography of aquaculture farms appears to be slanted to the wealthy. Role of ecosystem services provided by secondary mangroves to ultimately lead to the development of a "Management Plan for Secondary Mangroves" on a State/Division basis. Mangrove taxonomy in secondary mangroves to ensure retention of diversity and guidance to reafforestation if required. Soil mapping in secondary mangroves to determine which soil types are most suitable for aquaculture. Impact of in-pond mangrove forest decomposition on shrimp productivity. The potential use of harvesting this in-pond forest for timber could also be investigated. Suitable buffer zones between shrimp farms based on capacity to provide larvae for natural recruitment to farms and ecosystem services such as litter-fall/detritus, coastal protection, water flow dynamics, nekton refuge, etc. These research areas need to be complimented with economic analysis for industry development at the grass-roots and commercial level. That analysis must include training in farm management, markets analysis, transport systems to markets and hatchery services. Regarding the development of crab aquaculture in secondary mangrove environments, the farm visited in Myeik appears to be a very efficient operation and sets a model for replication at commercial and community levels. There remains a question of sustainability. Juvenile crab recruitment extends beyond the 290-acre farm limit and there is no control over where fishermen trap supply. Currently it's estimated that juvenile crabs are sourced in a 3-5 km radius from the farm site over the past 6 months of operation. Inevitably juvenile crabs will need to be sourced further a field to sustain supply. This removal of natural populations begs the question of sustainability and mangrove forest floor ecology. It is recommended that such farming operations should include a crab hatchery and that harvesting of natural populations should only be permitted to supplement supply. In any case harvesting from surrounding areas will need to be regulated. It is impossible to gauge the effects of this practise without ecological research of the role of these juvenile crabs in mangrove ecology processes. The establishment of a hatchery will also display a commitment for long-term investment rather than short-term investment. Its absence would facilitate a rapid exit. The crab farming model also has the potential to be adapted at community grass roots level development, as shown by experiences in the Ayeyarwaddy Delta. Consideration should be given to smaller farms operated by local community farmers. If this technology can be adapted to smaller scale farms - community level crab culture could be attractive to the international donor community. This may also enhance technology transfer for integration to larger scale farms. If small-scale crab culture were to be supported by harvesting natural populations it would be essential to determine populations and productivity among secondary mangrove forests to ensure these farms are sufficiently buffered with mangroves to support sustainable recruitment. There are also plans to establish large-scale foreign invested shrimp farms in this region with private investment from France and Indonesia. The size of these farms range from 200 to 40 000 acres. The impact of this scale on forest removal is unknown and should be evaluated. Present farming systems developed in mangrove areas have extremely low shrimp productivity, in some cases probably less than the fishery values of original mangrove resource (commonly 100-150 kg/ha of fisheries products from other regional countries, but values need to be verified for Myanmar). Upgrading and rehabilitation of low productivity of coastal ponds requires attention to increase value of the resource. Corals are an important coastal resource for sustaining coastal fisheries, particularly in the southern part of Myanmar. Information on coral reefs in Myanmar is limited compared to other countries in Southeast Asia, but estimates made by WRI (2002) suggest Myanmar has 1 686 km2 of coral reef area, around 1.7 percent of the Asia-Pacific total (see figure in adjacent box). An analysis of information on the status of the reefs suggests that the condition of coral reefs in Myanmar is relatively good compared to some other countries in Southeast Asia (WRI, 2002). Even so, the estimates suggest that 56 percent of Myanmar's reefs are at "medium" or "higher" risk from over fishing, or destructive fishing and anthropogenic factors (e.g. global warming) (WRI, 2002). The mission was unable to gather first hand data on the importance of coral reefs to coastal communities in Myanmar, but coral reefs are vital to the livelihoods of millions worldwide and particularly within the Southeast Asian region. In some areas, for instance the coastal regions of major archipelagos including Indonesia and the Philippines, as well as Small Pacific Island States, this dependence is extremely high (Burke, Selig and Spalding, 2002; Whittingham, Campbell and Townsley, 2002). Reefs are known to act as a 'key-stone resource' i.e. one ensuring that people just manage to escape poverty. Described as 'interstitial poor', in that they are often overlooked in coastal development projects, many groups do not have the resources to undertake alternative development options, (Whittingham, Campbell and Townsley, 2002) and are extremely vulnerable to any decline in reef condition. Further information on the coastal communities in Myanmar, and their relations to coral reefs, are needed. The recent development of aquaculture of groupers is dependent to some extent on collection of seed from coral reef areas. Live fish traders visiting Myanmar are also collecting fishes that are closely related to coral reefs, for trading into the live coral reef fish trade in Hong Kong and China. The value of this trade is difficult to assess, but appears to have increased over the past five years. Care needs to be taken to ensure that non-destructive fishing methods are used for this trade. To sustain grouper aquaculture in the country, it will also be necessary to move towards hatchery establishment. Some management initiatives been taken in coral reef areas. There are reported to be three marine protected areas (MPAs) in Myanmar. The management status is given as "unknown" in the WRI reefs at risk analysis and covers only 2 percent of reefs. This suggests the need for more extensive management of the resource. DoF has responsibility for management of one of these areas, in Lanpi Island in the Thanintharyi Division. The management is under the Township DoF officer in Boke Pyine (8 hours by boat from Myeik), who makes occasional visits. The marine protected area is mainly planned to be managed for tourism. DoF is institutionally responsible, however, apparently has limited capacity and awareness on coral or MPA management. · The government of Myanmar is many years behind its neighbours in recognizing and meeting the need to identify and preserve natural resources. Technical and financial assistance from experienced countries for institutional strengthening and capacity building of the Myanmar government are needed. · Major surveys are required to determine where various ecosystems are found and what their status is. Surveys should focus on little known areas, especially the Mergui Archipelago, to determine conservation potential. · In the university system in Myanmar, many well-trained scientists have retired. There is a great need for training of local scientists to survey and monitor coral reefs and other marine environments. · Organize training course and study tour for MPA planners and managers to neighbouring countries with established MPAs. Further information on the status of coral reef resources, people dependent on them, fishing practices, and conservation status, should be obtained, as the basis for suitable management measures of this important resource. It is recommended to build awareness and capacity within DoF for marine protected area management. Cooperation with some regional initiatives is also encouraged. Myanmar was included in a recent analysis of MPAs in Southeast Asia and the recommended actions are reported in the box on the left (derived from WRI, 2002). These recommendations may also be considered. DoF is making progress in environmental management of more intensive shrimp farms, and is encouraging the private sector through zoning and water treatment protocols. The team visited a designated shrimp culture zone at Kyauk Tan. The infrastructure of the zone includes a water supply and drainage system that allows for separate intake and discharge. Water reservoirs are also used for treatment of incoming water, and effluent ponds for discharge. The adoption of such environmental management measures in more intensive shrimp farming systems is welcome. Such initiatives should continue to be upgraded to support effective environmental management guidelines and support to the private sector. Cromileptes altivelis - a high value grouper species from a marine cage farm near Myeik. In the law relating to aquaculture enacted in 1989, there are several articles that control the impact of aquaculture on the environment. For example, changing the waterway and hydrology of the farming area in natural waters is prohibited. Also a DoF directive exists that stipulates aquaculture farm effluent should contain BOD of less than 10 ppm and a sedimentation pond should be used if the farm is more than 15 acres in area. Freshwater shrimp farming is not encouraged by a regulation that does not allow presence of saline water in freshwater areas. However, regulatory measures on importation of exotic species and exportation of live fish and shrimp need to be strengthened, a situation that risks the sustainability of aquaculture sector. There is also a need to strengthen government regulations to control drugs and chemicals use in aquaculture sector as mentioned above. The Government is giving high priority to coastal aquaculture development. A high level special development committee for shrimp culture was established for development of shrimp farming in 2000-2003. Demarcation, allocation and administration of land and water for aquaculture. Granting leases and issuing licences for aquaculture. Monitoring and inspecting aquaculture enterprises. Taking legal action against any person who contravenes the law. The Myanmar Foreign Investment Law, also provides incentives for investment in aquaculture. As export income from coastal aquaculture has been increasing, the government interest and support for the sector has also been growing. The enactment of the Myanmar Fisheries Law in 1990 prohibits the use of destructive fishing gears, amongst other regulations for management of the capture fishery. The Department of Fisheries (DoF) of the Ministry of Livestock and Fisheries is the major government institute responsible for management of coastal aquaculture development. The DoF has an officer in every coastal township, although the DoF officers are mainly responsible for licensing and policing of licenses. A diagram of institutional set up of the DoF is provided in the inland team's report. With regard to coastal aquaculture, the Department of Fisheries is presently mainly focused on licensing, and quality assurance through Yangon (quality assurance in the two areas visited by the mission, is mainly done by private sector, or through sending samples to Yangon. Testing facilities are under development in Myeik). The mission considers that there is a need to build the capacity for extension and delivery of services to the private sector and coastal poor engaged in aquaculture/fishers. The DoF also has responsibility for research, however, this function needs to be substantially strengthened if it is to address the key researchable issues relevant to coastal aquaculture development in the country. The Ministry of Agriculture is not directly involved in coastal aquaculture, but its policies have major influence on the fisheries sector, particularly the conversion of wetlands to rice paddy (and associated loss of fisheries habitat), and restrictions on use of agriculture land for fisheries and aquaculture, and multiple use of reservoirs for fisheries. The Ministry of Science and Technology is reported to support some aquaculture research however no further information was provided to the mission. The Ministry of Forestry is responsible for management of forests, including mangrove forests. It appears though that the management of 'secondary' forests for aquaculture has been ceded to the Department of Fisheries. The Ministry of Forestry also has some responsibility for management of protected areas. The University of Yangon and Maw-la-myaing (Moulmein) provide teaching and research in coastal aquaculture. These universities offer few aquaculture related courses in the curriculum of the Department of Zoology of Yangon University and Department of Marine Science of the University of Maw-la-myaing. Recently, universities have redrawn their curriculum in line with needs for the country's development programme, including aquaculture. However, there is reported to be a shortage of human resources and basic facilities for aquaculture related education and research. Win Lat (2003) reports that aquaculture related programmes at the universities are not linked closely with private or government organizations with limited practical training. The issues for development of the coastal aquaculture industry can only be addressed via research to provide knowledge for decision makers and policy development, and to help solve problems faced by farmers. An understanding of processes and ecosystem functions and services can help aquaculture develop in a sustainable manner. The building of capacity for research within the Department of Fisheries would be a significant step in addressing these issues. Re-investment into the fisheries industry from its contribution to GDP could support sustainable growth and may provide a basis for improving livelihoods through lower barriers to entry by grass-roots level farmers. Mangroves are an integral dimension of the coastal zone function and protection. While some may have to be converted for aquaculture industry development, it is important to ensure that those mangrove systems that are most critical to the coastal zone are retained. The role of secondary mangroves to fisheries and to the wider coastal zone needs to be investigated for the range of services offered. These include their role as nektonic habitats, land runoff entrapment, coastline protection, tidal flow dynamics and habitat connectivity. A number of other researchable issues arise from the mission and are discussed elsewhere in this report. A cornerstone for sustainable coastal aquaculture is the development of well-trained people. Education and training is therefore essential to support the sectors growth. DoF has taken some initiatives in this regard, with a special course in shrimp culture in 2001. The DoF stations organize 3-month courses in freshwater fish culture at fisheries stations. However, these efforts need to be significantly strengthened and coordinated. For example, the mission noted only one trained aquaculturist (completing a Masters degree at the Yangon University) in the whole Thanintharyi Division, an area with major development potential and investment focus by foreign companies. Education and training is therefore an important issue that needs to be addressed in the short and long-term. A structured approach involving DoF and Universities (e.g. Yangon, Maw-la-myaing) would be preferable. There are opportunities to further engage the private sector more actively in supporting training courses (such as the 2001 shrimp course conducted by DoF). Donor assistance might also be provided in designing, developing course materials, training of trainers and teaching. There is a small but increasing involvement of international NGO's in supporting rural development in Myanmar, and some are showing an interest in fisheries and aquaculture for poverty alleviation. The Myanmar Fisheries Federation, part of the ASEAN Fisheries Federation, is also supporting aquaculture development in Myanmar, although appears to be mostly focused on inland areas. UNDP/FAO project Environmentally Sustainable Food Security and Micro-income Opportunities in the Ayeyarwaddy (Delta)-MYA/99/008 (recently completed). UNHCR funded FAO project titled Support for Agriculture and Natural Resources Development (GCP/MYA/001/HCR). Given the fact the aquaculture sector is expanding rapidly, and with staff constraints within the DoF probably continuing for some time, it is likely that the NGO sector can and should play an important role in the future development of coastal aquaculture within the country. One of the critical issues for sustainable coastal aquaculture development is land use policy, and to have planning processes in place that allow balanced use of land for aquaculture, and other uses in coastal areas. The precursor of aquaculture zoning is seen in the Law Relating to Aquaculture (1989) where Section 11 provides the right of the Department of Fisheries to define land for aquaculture. The land use policy in coastal areas is directed towards agriculture development. There appears to be a lack of flexibility in using agriculture land for aquaculture. This may be focusing shrimp farm development towards less suitable mangrove areas, when more suitable sites may be available on sub-optimal agriculture land. According to interviews with farmers in Rakhine, farmers obtain permission from the village government, then the request will be referred to the township and district level, and possibly state/division, and central government for approval. There appeared to be no overall plan for coastal aquaculture development in coastal areas that clearly identifies suitable areas and zones. Although these issues were not explored in detail during the mission, government should consider the adoption of an integrated coastal management planning approach. As there is limited experience on this approach in Myanmar, some pilot studies could be initiated first, in one or two locations, and then gradually expanded depending on experience. Without effective management of coastal resources, the considerable social and economic value of Myanmar's habitats, including mangroves, and coral reefs, will be significantly reduced. Balancing the immediate needs of coastal communities, the desire for long-term sustainable resource use, and the maintenance of natural ecosystem processes is a significant issue in most coastal areas. Together, these goals should form the guiding principles for coastal management. The Myanmar government welcomes foreign investment in the aquaculture sector, and several large investments are on-going or planned for aquaculture in the coastal divisions. There are a number of institutions involved in the approval of foreign investments in the aquaculture and fishery sector. Further details are provided in a FAO report (www.fao.org/docrep/field/382903.htm) (Support to Special Plan for Prawn and Shrimp Farming, Myanmar, TCP/MYA/4554). The current markets for coastal aquaculture products are almost solely export. Products are exported to a wide range of countries, as frozen product (shrimp, soft-shelled crabs) or in live form (mud crabs, groupers and lobsters). The sector already contributes significant foreign exchange. There are a number of market trends that have implications for coastal aquaculture, particularly shrimp (chemicals, trace-ability, development of market chains), and live marine fish (standards are currently being developed for import of live fish to Hong Kong by APEC). These regional and global trends will influence the future development of aquaculture in Myanmar. Chemicals and residues in aquaculture products deserve particular attention. Myanmar's coastal environment offers opportunities for a "clean, green" image for aquaculture products. Image and markets may be damaged by chemical/ health problems, and in some markets may be influenced even by use of mangroves for shrimp farming. There has been some commendable work on quality assurance, and there is a need to continue to develop quality assurance/clean quality product through working closely with responsible private sector. Promoting the development and adoption of codes of conduct and "better management practices" (BMP) schemes with the private sector would provide a basis for a set of informal "rules" that might help guide investment and management of the export-oriented sector. The market incentives for sustainable management of aquaculture and fisheries products globally are becoming more significant. These trends will influence Myanmar, particularly increasingly attention to certification and traceability. Coastal aquaculture in Myanmar is mainly limited to shrimp farming, with smaller quantities of mud crabs and groupers produced. The sector contributes significant export earnings, and shows potential for future development and diversification. Extensive brackishwaters, tidal estuaries and clean marine environments exist along a long coastline of nearly 3 000 km, with potential for coastal aquaculture development. Most coastal aquaculture in Myanmar is practiced with traditional methods, but intensification of shrimp farming in particular is gathering pace. Because of low urbanization and industrialization in coastal areas, water pollution caused by chemical and industrial waste is negligible, providing opportunities for production of high quality product. However, degradation of habitats, such as coastal mangroves, and coral reefs, is a concern. Government policy is supportive to expansion of coastal aquaculture, but careful attention is required to its sustainability, to maximize creation of opportunities for employment, income generation and improved livelihoods of people living in Myanmar's coastal areas. The general picture that emerges from the mission, and review of secondary information, is of a coastal population that includes significant numbers of poor and vulnerable people and a high proportion of people dependant on fisheries activities and aquatic products for income and nutritional security. Coastal aquaculture development is presently quite limited, but already the livelihoods of perhaps several thousand people are directly and indirectly involved in the sector. There appear though to be significant barriers to entry of poor people into coastal aquaculture. These barriers seem to include land access, skill acquisition, access to credit and support services, scarce availability of small land holdings, lack of micro-credit systems and security of land tenures. 1. Opportunities may be substantial to support local development through sustainable coastal aquaculture initiatives. Information is required (e.g. through livelihood analysis in Rakhine and Thanintharyi regions) to better understand livelihoods and gauge opportunities for participation in aquaculture. Such information could be obtained by the upcoming censuses, or perhaps through special local (e.g. township) level assessments. 2. Investment in coastal aquaculture so far is focused on export commodities; and it appears to be mainly wealthier individuals/companies who are directly involved, with shrimp as the main item, and smaller quantities of crab and grouper. 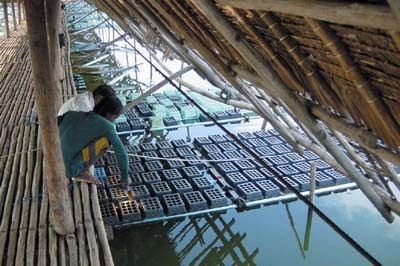 Investment by larger companies/individuals has proved important in developing technology and infrastructure for aquaculture, for example, private sector investment support to shrimp hatcheries and employment, such as several hundred people involved in Myeik (women in soft-shell crab farms) and input supplies (mud crab, trash fish, and grouper fry supply to cage farms in Thanintharyi Division). 3. The opportunities for participation of local smallholders in coastal aquaculture should be further explored, and government, donor and private sector investment could then be focused on support to poor people where opportunities exist. There are major questions of technology, extension support, capital access and security that remain unanswered on the potential for small-scale poverty-focused mariculture. If non-technical constraints can be better understood and addressed, technology for several species might offer opportunities to support small-scale aquaculture in coastal areas, which will contribute to foreign exchange earnings and poverty alleviation through coastal development. 4. There are questions about the resource sustainability of aquaculture systems based on capture of wild stocks. Mud crabs, grouper and potentially lobster cultures are based on capture of wild stocks, and sustainable development of such systems depends on sustainable supply of inputs (feed and seed). Value-added culture can provide positive economic benefits to fishers and the country, as they value add to existing resources and provide foreign exchange. However, sustainability is a long-term issue and at least for groupers already appears to be an emerging constraint. 5. Research should be conducted on capture fishery based aquaculture systems to determine the sustainability of present practices and used to prepare advice on sustainable management. Mud crab farming and fattening practices show considerable potential for smallholder involvement and should be given priority in such research because of the high volume captured and traded. 6. Priority should be given to hatchery development for crabs and marine fishes, as a sustainable basis for future development of the industry. 7. Shrimp farming in mangrove environments, classified as 'secondary' mangrove habitats, raises questions of sustainability due to acid sulphate soils, and downstream environmental and social effects due to replacement of mangroves with shrimp ponds, particularly low productivity extensive systems. The role of secondary mangrove systems should be assessed and effective mangrove management plans put in place. Mangroves should be evaluated for their contribution to fisheries, acid-sulphate soil problems, economic values, and retention for mixed silviculture/shrimp farming to diversify income risk among farmers. Knowledge of sediment dynamics in these coastal regions is also required to identify role of coastal mangroves in sediment entrapment deposition/erosion. 8. The productivity of existing shrimp farming systems developed in mangrove areas is extremely low, in some cases probably less than the fishery values of original mangrove resource (commonly 100-150 kg/ha of fisheries products from other regional countries, but values need to be verified for Myanmar). Upgrading and rehabilitation of low productivity coastal ponds and degraded mangrove areas should continue to be given attention. This may involve introduction of improved aquaculture systems, such as mud crab culture and restoration of mangroves where suitable. Opportunities exist for sharing experience with previous ACIAR/NACA projects on mangrove-aquaculture systems in Viet Nam, and acid-sulphate soil mapping in Indonesia, and SEAFDEC's mangrove research. 9. The Department of Fisheries is making progress in environmental management of more intensive shrimp farms, and is encouraging the private sector through zoning and water treatment protocols. These initiatives are welcome and should be continued and improved for effective environmental management of the sector, and for ensuring sustainability of existing private sector investments. A comprehensive environmental management plan should be agreed with private sector investors in the shrimp industry in Myanmar, as a voluntary Code of Practice for future investment and development of the industry. 10. There is a need to explore and introduce effective coastal planning to support balanced development in coastal areas between aquaculture, coastal fisheries, and other coastal resource uses. The land use policy in coastal areas is directed towards agriculture development, and there appears to be a lack of flexibility in using agriculture land for aquaculture. This may be focusing shrimp farm development towards less suitable mangrove areas, when more suitable aquaculture sites may be available on sub-optimal agriculture land. 11. Coastal planning processes and zoning should be further reviewed with a view to adopting integrated coastal planning processes that would allow for balanced use of resources for aquaculture and other uses. As integrated coastal planning and management is a new concept in Myanmar. One or two pilot areas might be used for testing and development of a suitable approach, for subsequent wider adoption. Zoning principles should be applied to separate major shrimp farming and hatchery zones away from each other, as part of a health management strategy for the shrimp industry. 12. Coral reef resource systems are an important coastal resource for sustaining coastal fisheries, particularly in the southern part of Myanmar. Further information on the status of coral reef resources, people dependant on them, fishing practices and conservation status should be obtained, as the basis for suitable management measures of this important resource. The DoF has institutional responsibility for one marine protected area in a coral reef area, but has limited capacity and awareness on coral and marine protected area management. It is recommended to build awareness and capacity within DoF for marine protected area management. DoF is also encouraged to explore linkages with the Global Coral Reef Monitoring Network (GCRMN). 13. Most shrimp farms practice traditional methods, but the DoF is trying to encourage improvement of extensive systems, and intensification of shrimp farming in particular is gathering pace with several recent investments in more intensive shrimp farms. The technology and management practices can be further upgraded through capacity building and awareness campaigns based on experiences in other Southeast Asian countries, particularly on issues that influence the sustainability of the sector (e.g. shrimp disease and environmental issues). 14. There are several promising species for diversification of coastal aquaculture in Myanmar, and considerable opportunities to exchange experience with other countries in the region. Technical cooperation with other countries in coastal aquaculture technology and management should continue to be promoted. A programme of technical exchanges should be established, to effectively draw on experiences of other countries, to develop sustainable coastal aquaculture in Myanmar. Such networking should include DoF, the private sector, educational institutes and NGOs (such as the MFF and others active in community development and poverty alleviation). The Department of Fisheries appears to be mainly focused on licensing, and quality assurance through a laboratory in Yangon. A coastal station is planned near Myeik to support mariculture development in an area with significant potential. 15. In general, the mission felt the need to build the capacity for extension and delivery of services to the private sector and coastal poor engaged in aquaculture/fishers. Capacity building among DoF staff, and particularly the younger staff, should be given a high priority. Education and training should be addressed through both short and long-term approaches. A structured approach and plan involving DoF, Universities and NGO's should be prepared for long-term capacity building in the sector. 16. Donor assistance might be provided in designing, developing course materials, training of trainers and teaching, both within the DoF, and in NGOs (e.g. MFF) for better informed management of coastal aquaculture development in Myanmar. Promoting linkages to other countries in the region is essential for effective exchange of experiences and capacity building. 17. The DoF recognizes the potential for future development of mariculture in the southern part of Myanmar. The main initiative for mariculture development in this area within DoF is the plan to establish a marine aquaculture station at Kyun Su Township in Thanintharyi Division, starting in 2003. The DoF plan to start work with seabass culture, but eventually will extend the work to include groupers. External assistance should be considered for training of staff, and design of the facility. 18. Encouraging active participation of NGOs in coastal aquaculture development would be one strategy to build capacity and experience quickly, supplementing the DoF staff limitations. Shrimp disease problems have recently emerged, but are already causing severe economic impacts on shrimp farms in Myanmar, including even extensive farms. The effects on wild populations are unknown, but it appears that shrimp brood stocks are already infected with white spot syndrome virus (WSSV) to varying degrees. There is evidence that WSSV was introduced to the country through shrimp post-larvae. The current situation, if not brought under control through urgent and coordinated action, represents a serious threat to the sustainability of shrimp farm investments, Myanmar's ability to attract foreign investment and future trade status. 19. Policy should be clearly developed on the introduction of species to Myanmar. A national strategy should be formulated and implemented for practical implementation of the Asian Regional Technical Guidelines on Health Management and Responsible Movement of Live Aquatic Animals. 20. The current ban on further imports of live aquatic animals should be continued, including Penaeus monodon and Penaeus vannamei, since there are no risk assessment measures in place for imports and no facility for quarantine and testing the quality of the imported animals. Introduction of suitable risk assessment procedures, in cooperation with the private sector, is strongly recommended. f) Existing experiences from NACA, FAO and ACIAR support in the Asian region should be engaged to support development of a responsible shrimp sector. The use of chemicals in shrimp aquaculture is a serious concern. The team recommends development of regulations, with the private sector, on chemical and drug use, including a list of banned chemicals, instructions on safe storage/use, ingredients, and withdrawal periods, clearly written in the Myanmar language. There are several large investments on-going or planned for coastal aquaculture in Myanmar. The mission was concerned as to whether the question of (environmental, economic, social) sustainability had been fully addressed, and what the incentives were for long-term perspective on sustainable investment. Problems have already emerged because of introduction of disease by the private sector, which has jeopardized shrimp farm development in Myanmar. The private sector should be encouraged to positively support the development of the sector, such as through longer-term capacity building, and development of Codes of Practice. The mission suggests a Code of Practice be developed with the private sector that would be a condition of further investment in the sector. The current markets for coastal aquaculture products are almost solely export. Products are exported to a wide range of countries, as frozen product (shrimp, soft-shelled crab) or in live form (mud crabs, groupers and lobsters). There are a number of market trends that have implications for coastal aquaculture, particularly shrimp (chemicals, trace-ability, certification), and live marine fish (standards are currently being developed for import of live fish to Hong Kong by APEC). These regional and global trends will influence the future development of aquaculture in Myanmar. The team considers that Myanmar's coastal environment offers opportunities for a "clean, green" image for aquaculture products. There has been some commendable work on quality assurance in Myanmar, and there is a need to continue to develop quality assurance/clean quality product through working closely with responsible private sector. Therefore, the emphasis should be towards responsible development of the sector. This may be accomplished by the development and adoption of Codes of Practice with the private sector that would provide a basis for a set of informal "rules" that might guide investment and management of the export-oriented sector. Myanmar is also encouraged to engage in regional and international discussions on such issues, and promote international investment in aquaculture that adheres to such codes and emerging certification principles. The mission was concerned over the need to generate more updated information on maximum sustainable yields of marine fish stocks, as a basis for sustainable management. IUU fishing, including possible use of destructive fishing practices in coral areas should be further investigated and actions taken to address problem areas. The mission did not investigate this issue in any detail, and are just noting here the need to generate a better understanding of marine fish stocks and catches, to provide a sound basis for sustainable management. Such investigations may be taken up by FAO, UNDP, SEAFDEC and other supporting agencies. Better understanding of livelihoods of people living in coastal areas, and development of smaller-scale aquaculture farming systems that directly support the livelihoods of poor people. Initial information on coastal livelihoods might come through incorporation of relevant fisheries questions into upcoming censuses and also cooperation with the Asian regional STREAM Initiative. Research on the resource sustainability of coastal aquaculture systems, perhaps initially emphasizing mud crabs that represent a significant opportunity for small-scale aquaculture development. Development of strategies for environmental sound planning for coastal aquaculture development and integrated coastal area management. Research to understand the values of coastal mangrove forests and improving integrated aquaculture-mangrove farming systems. Support to development of the mariculture station and programme in southern Myanmar, an area of significant coral reefs and fishery importance. Implementation of more effective shrimp health management strategies as a matter of some urgency. Support to development of a set of better management practices (BMPs), or a Code of Practice, that can provide the basis for an agreed set of rules for shrimp farm development by the private sector, and ultimately support sustainable development of the shrimp sector, and market access. Institutional development through education and training as a long-term initiative to build capacity for responsible management of the coastal aquaculture sector. Continued technical exchanges in mariculture development to support diversification and development of mariculture in Myanmar.